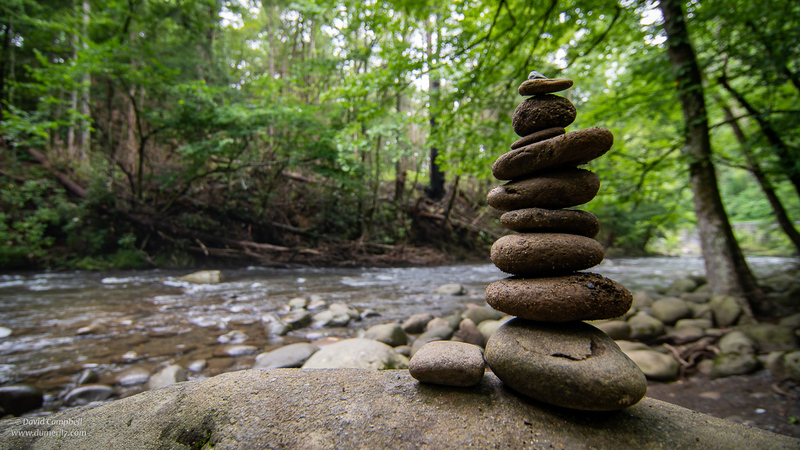 If you hike along any river or creek in the Great Smoky Mountains, you're bound to happen upon several river cairns. They're kind of interesting to look at. And people find the process of building them to be relaxing and meditative, kind of like nurturing and pruning a bansai tree. They also make a neat picture, in an Instagram sort of way. I happened upon this one and took my obligatory shot. I suppose I'd be remiss if I didn't say that building these things on a river is not a good thing to do from a conservation standpoint. Yeah, I know, "What's a few stacked stones going to hurt?" The same thought has definitely occurred to me. The devil is always in the details though. It is an undeniable fact that most every living thing in those rivers is dependent on those rocks. The rocks are habitat for all kinds of plants and animals – algae, insects, fish, fish eggs, salamanders – all of which are food or oxygen sources for other plants and animals. Every rock pulled from a stream can result in literally hundreds of organisms dying. Then consider that 10 million people visit the Smoky Mountains annually. If only 1% of these people are building cairns, that's the impact of 100,000 people every year. In matters like these, the Boy Scouts have it right: Leave No Trace. The place is already awfully gorgeous without them. One could argue that people like me aren't helping by taking pictures of them. I'll have to think about that some more honestly. I will say that I've never built one.